Home Other Articles Animals: Which Animals Are the Laziest? 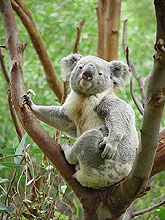 Koalas sleep the longest: 22 hours a day, on average. You would, too, if you only ate 21-29 ounces of eucalyptus leaves a day. This amount of food provides them with as much energy as one serving of breakfast cereal. Sloths rest the most. In addition to sleeping 15 to 18 hours a day, sloths move slowly on the ground, at a rate of 15-30 cm (0.5-1 feet) per minute. They can sometimes appear grey-green in color (even though their coats are greyish-brown) because they move so slowly that algae will grow over their fur.